If you’re looking for an easy to make meal for four, that has a Mediterranean taste, and flair of Greece then consider the following dish. 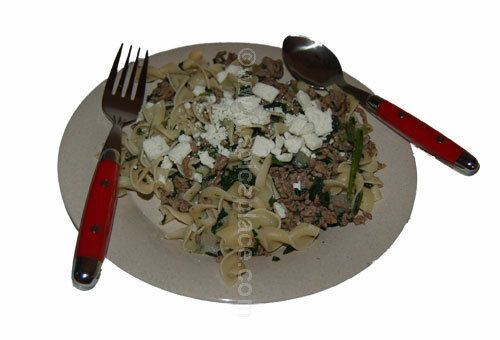 It’s made with ground lamb, spinach, onion, egg noodles and is flavored with McCormick Greek Seasoning. Some Feta cheese adds the final taste of Greece to the dish. First start this dish by browning the ground lamb. At the same time heat 2 quarts of water to boiling in a 3 quart pan. For the ground lamb, I used store bought lamb from Safeway and there was a bit of fat in the pan after cooking. So what I do is soak up the fat with Viva paper towels, they’re really absorbent. Just swish them around in the pan with the spatula. I had to use several towels and must have been unlucky in the package of ground lamb I choose. Add 1 1/2 cups of egg noodles to the boiling water; these will cook for 7 to 8 minutes. Sprinkle the seasoning evenly over the pan so the meat is flavored equally. Cook until the onion is clear. Add 1 to 1 1/2 cups frozen chopped spinach leaves to the skillet, stir often to cook the spinach evenly. After 2 to 3 minutes the spinach should be cooked, and if the timing is right your egg noodles will be ready to drain. Test by tasting one, and if done drain, add to the skillet and stir in well. To serve, scoop out some of the mixture into a bowl or plate and top with some crumbled Feta cheese. If you like Greek cooking, you should be happy with this simple noodle dish. Cooking time is about 20 minutes total. Tired of eating plain old hamburgers, or are just looking for something a little different to have on the barbecue this weekend? Consider using different meats for your burger grilling needs. Delicious burgers can be made from ground pork, chicken, turkey, and lamb. The secret is to properly season these meats before cooking so that the resulting burger is tasty. Lamb is a traditional Greek meat dish which is often seasoned with mint. We love the flavor we get when we use McCormick’s Greek Seasoning with lamb dishes, and the lamb burgers are no exception. This is really a quick to make and unique tasting burger. Place ground lamb in a bowl. Sprinkle 1 tsp of Greek Seasoning over top of the meat and mix. Sprinkle remaining 1 tsp of Greek seasoning over top of meat and mix well. Then form into 4 to 5 burgers. Grill until well done. Serve on toasted rolls. 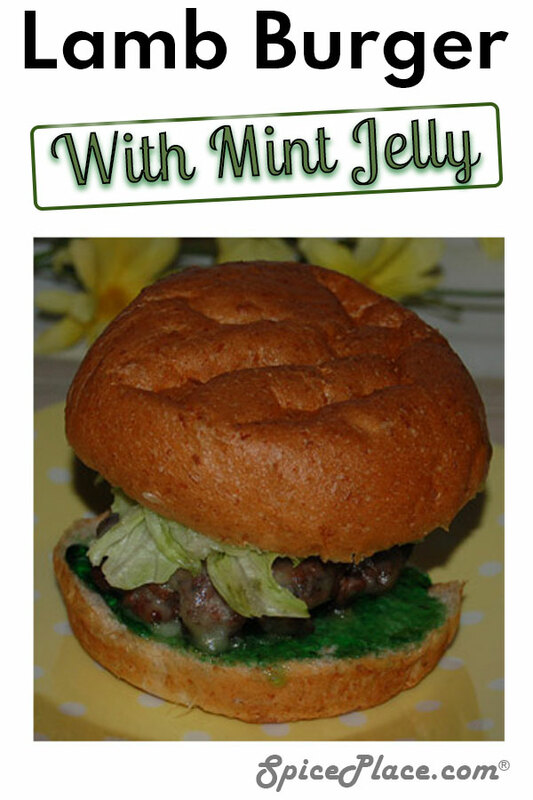 We served our lamb burgers on toasted rolls spread thinly with mint jelly. Top with lettuce, tomato, and cheese. We’re continuing to find delicious ways to use our newly found McCormick Greek Seasoning. This week we found that it has a wonderful affinity with lamb. While we’ve used Greek Seasoning with lamb chops, the flavor seems more pronounced to us when it was mixed in with the ground lamb meat. 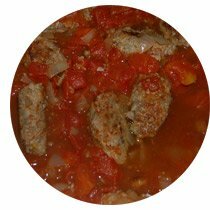 In this recipe for Lamb Sausages with Tomatoes, the flavor of the tomatoes adds a wonderful contrast to the lamb and seasoning resulting in a delight for the taste buds. Combine the ground lamb, rice, diced onion, egg, and 1 1/2 tbsps orange peel in a small bowl. Mix well with hands to distribute rice and seasoning throughout the meat. Form into miniature sausage shapes about 3/4″ in diameter and 2 inches long. Heat 1 tbsp canola oil in a non-stick skillet, then add the sausages. Cook about 3 to 4 minutes, then turn and repeat until all sides are lightly browned. When turning the last time, add 1/2 cup diced onion. Cook the onion for 3 or 4 minutes, then add canned diced tomatoes, 1 cup chicken broth, and 1/2 tsp Greek Seasoning. Gently mix to blend the tomatoes with the broth but not break up the lamb sausages. Bring to a boil, reduce heat to medium, and simmer for 10 minutes to boil off some of the liquid and thicken the sauce. Stir and cover sausages with the sauce. Simmer for 5 minutes more. Use remaining orange peel as a garnish for each serving. 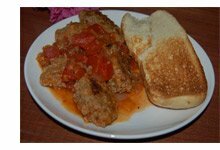 Serve Greek Seasoned Lamb Sausages with a piece of toasted Italian roll to dip into and mop up the sauce. Makes 4 servings. Try out these Greek seasoned meatballs if you want a change of taste in your daily meals. The flavor of the lamb and the citrus/mint/thyme seasoning of the McCormick Greek seasoning blend makes a delicious meatball. The hardest part we had in making this recipe was finding ground lamb. After going to 3 or 4 grocers that we thought would have ground lamb, we found it at a local Safeway store. Prepare a place for setting meatballs on by placing wax paper on the plate. Place the ground lamb in a large bowl. Sprinkle the bread crumbs and chopped onions over top of the lamb. Scramble egg and mix in the Greek seasoning and parsley flakes. Pour the eggs over the lamb, and using your hands mix the lamb, bread crumbs, onion, and seasonings together for about a half a minute. 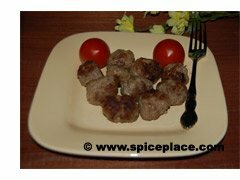 Take a bit of the lamb mixture, and form into 3/4 – 1″ meatballs by rubbing in the palms of your hands. Place formed meatballs on the plate. Repeat for all meatballs. Place 1 tbsp canola oil in a 12″ skillet, and heat. Add meatballs. Cover and cook meatballs for about five minutes, then flip and cook for another 5 minutes. Remove cover, and flip meatballs to another side and cook until brown. Continue to flip and cook until meatballs are cooked though and are brown. Makes about 20 Greek Seasoned Meatballs. Serve wits Couscous or Greek Tomato-Potatoes.